Goal Kickers – Johnson 3, Baxter 2, Hancock 2, Manteit 2, Wilkinson 2, Boston, Hall, Dale, Fyfe. Best Players – Davis, Clayton, Manteit, Reeves, Dale, Ford, Hancock, Wilkinson, Charlesworth. 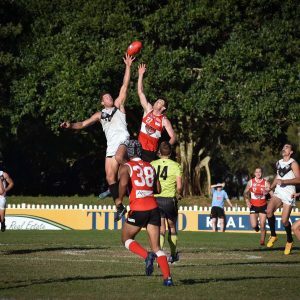 Southport have reclaimed top spot on the NEAFL ladder after a courageous win yesterday against the tenth placed Redland Bombers. After losing Kai Sheers to concussion early in the first quarter then Tyler Roos at half time with a corky, the boys dug deep to overrun the bombers after being headed late in the third quarter. Struggling to hit the scoreboard at all in the first ten minutes of the game, Wilkinson then Baxter were able to covert but our inaccuracy kept Redland well in the contest. Mitch Johnson was the shining light in the second quarter as he slotted 3 majors to extend our lead out to 17 points at half time. Our fitness levels were about to be tested as Manteit, Wilkinson and then Baxter were asked to play out the game with no rotations. Redland made a challenge during the third quarter with Matt Hammelmann proving hard to contain. His two goals helped Redland hit the front at the 18 minute mark. Baxter and Boston steadied the ship and we went to three quarter time two goals in front. Redland kicked the first goal of the final quarter and it was game on! As good sides do though, we lifted again and Manteit, Fyfe and Dale all goaled during the next 10 minutes which set up a five goal buffer. This would prove too much for the plucky Bombers to reel in.